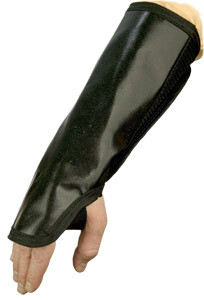 TurtleSkin Sleeve and TurtleSkin Sleeve Plus are constructed of two layers of TurtleSkin puncture- and cut-resistant materials. The inner layer of the protective sleeve is a medium-weight TurtleSkin aramid material that is soft on the skin but also extremely tough on needles and sharp edges. The outer layer is a coated TurtleSkin material that is tough enough for the harshest environments. This combination results in a rugged sleeve that protects your arm against punctures, cuts, and needles while remaining soft, flexible, and comfortable. Protective applications include waste handling, glass handling, animal handling, metalworking, plywood and veneer handling, pulp/paper handling, and food processing. 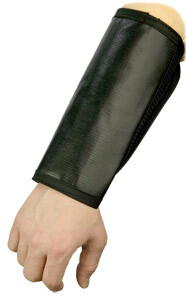 The TurtleSkin protective sleeves were tested to verify cut and puncture performance. The cut and puncture tests were performed using TurtleSkin, aramid knit, and cowhide leather. The cut test measured how many pounds of force it took to cut each material with a No. 10 surgical steel blade. The results show that it took 7.4 pounds of force to cut the TurtleSkin System, 1.5 pounds of force to cut the aramid knit, and 0.7 pounds of force to cut the cowhide leather. The TurtleSkin System is more than four times more cut resistant than an aramid knit and ten times more cut resistant than cowhide leather. The puncture test measured how many pounds of force it took to puncture each material with a 0.05-in. solid steel needle. The results show that it took 7.3 pounds of force to puncture the TurtleSkin System, 0.6 pounds of force to puncture the cowhide leather, and 0.03 pounds of force to puncture the aramid knit. The TurtleSkin System is more than two-hundred times more puncture resistant than the aramid knit and twelve times more puncture resistant than cowhide leather.